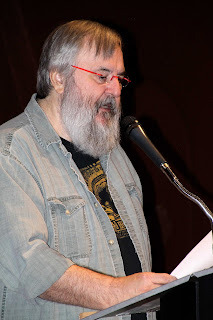 I found out last week from a posting by poet and educator Brandon Cesmat that his close friend and fellow poet Terry Hertzler had passed away. Terry was an energetic and constant force in the Southern California poetry scene. The loss of him is a sad moment for the community of poets and poetry aficionados in our town. I met poet Terry Hertzler in the mid seventies, I believe, through a mutual friend, the great poet Paul Dresman. The precise time and place are lost to me--UCSD amid the Quonset huts? downtown San Diego at one of the CETA founded art shows and poetry readings? on a Hillcrest corner while in line at a bistro for a glass and a piece of keish? None of that , perhaps, but what matters was that Terry, a Vietnam vet who'd recently published his first book of poems, The Way of the Snake, recounting experiences and baked-impressions as a soldier in that ill-fated adventure, was a great guy, affable, gregarious, and , it turned out, a fine poet, a strong writer. Way of the Snake revealed what would become Terry's stylistic signature,a spare, lean presentation of image,impression, fact, a sharp and acute journalistic sense for the telling detail,an ear for the crusty, rich, terse rhythms of speech. He knew when to enter a scenario, he knew how to use the ever problematic first person pronouns, he knew how to build tension, and he knew when to fade to the background, to allow his scenarios to speak their own sweet and bitter ironies of death, love, the failure of men to do better in a world that confounds the rhetoric of good intentions. The man could write. We were not close friends,but we ran in similar circles that make up the always rich and fascinating San Diego poetry community. He ran poetry series, championed the work of other writers, and had a small press from which he issued a steady stream of quality chap books that brought the world up to speed on how Terry was responding to the world, reflective, deeply felt, beautifully fit, image to page, word to musical phrase. There isn't much information about this fine poet's passing, and here I think it best to let the man's poetry speak for itself. These four poems are from Serving House Journal. I pick her up on Central Avenue, Saturday night,drugged out of her mind or crazy some other way. of models or pampered Connecticut debutantes. to shore. It’s August in Phoenix, the river nothing butdust and memories, but I take her home with me anyway. Look, we’ve made a baby, just like Mary and Joseph. I let her use my shower. with magic, and she claps her hands and kisses me. best way a thing can be, asexquisite as a well-lived life. shadows across their faces beneath the trees. They’re gone now. The shadows. The faces. Most likely even the trees. of my girlfriend’s house, 3:00 a.m.
stars grinning down, me grinning back.